Hi! I'm Elena! Welcome to my travel blog Creativelena.com. For me, it is all about “life-seeing instead of sightseeing”: Join me as I create, eat & live my way around the world. Curious? 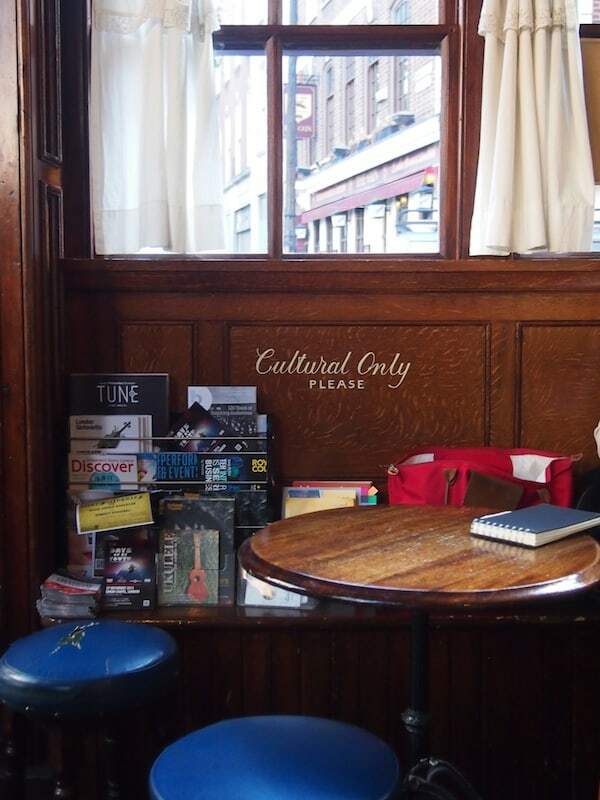 *Check out my book, “The Creative Traveler’s Handbook”, for learning more about what we mean by creative travel. Travelling means the world to me, makes me fit for everday life and sometimes, I trust, also calmer on the inside. Read this blog with a smile, share what you love and remember to check back regularly: After all, when was the last time you did something for the first time? 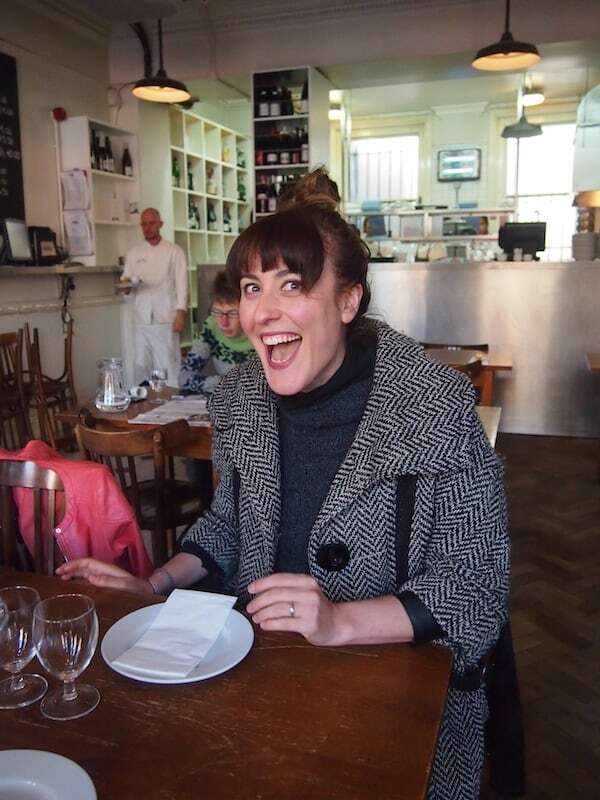 And Nicole, my Eating London tour guide, does not rank behind my very own enthusiasm either! 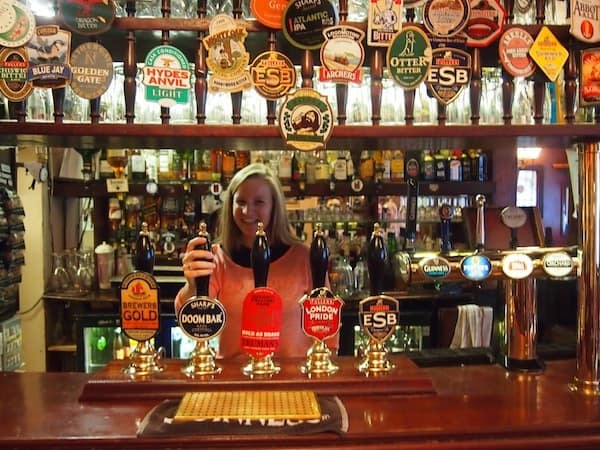 Her passion for food explorations in the East London district of Spitalfields Market & Brick Lane means she literally “goes out of her way” to show us the hidden gems and less obvious #foodlover sites in this part of London. Follow us, therefore, as we reveal a kaleidoscope of colours, scents & people on our way to food heaven in London! (Oh yes. The British DO know a thing or two about great food. As with everything, you just have to know where to go!). 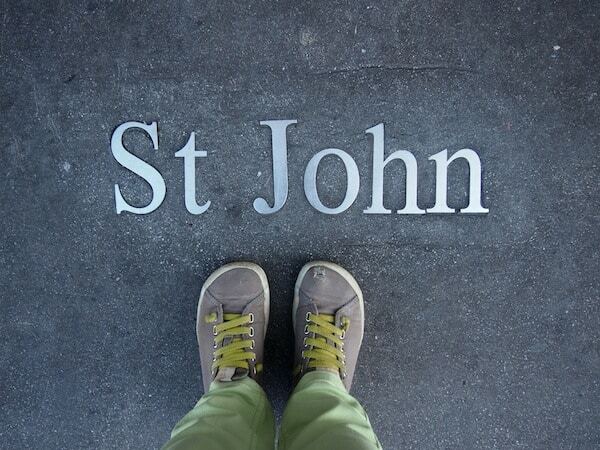 The East End London Food Tour #1: St. John Bread & Wine. It actually sounds quite Catholic don’t you think! 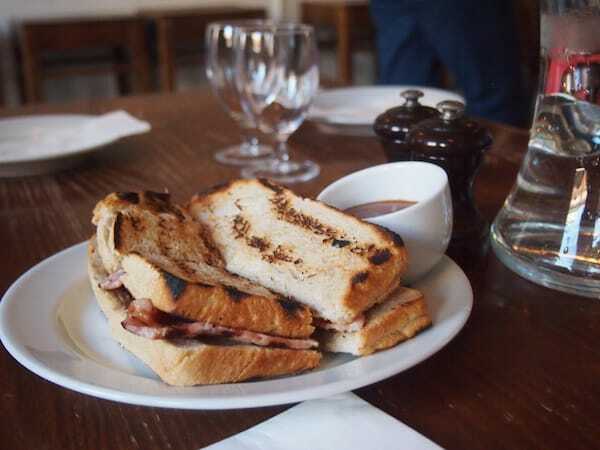 Its famous bacon sandwich to greet #foodlover travellers on their first bite into “Eating London” is definitely a sin to go for though: Be sure not to have breakfast ahead of the tour. You will eat lots here on what is a total number of eight tasting stops, each highlighting the very best in terms of food & drinks that are available in the area. 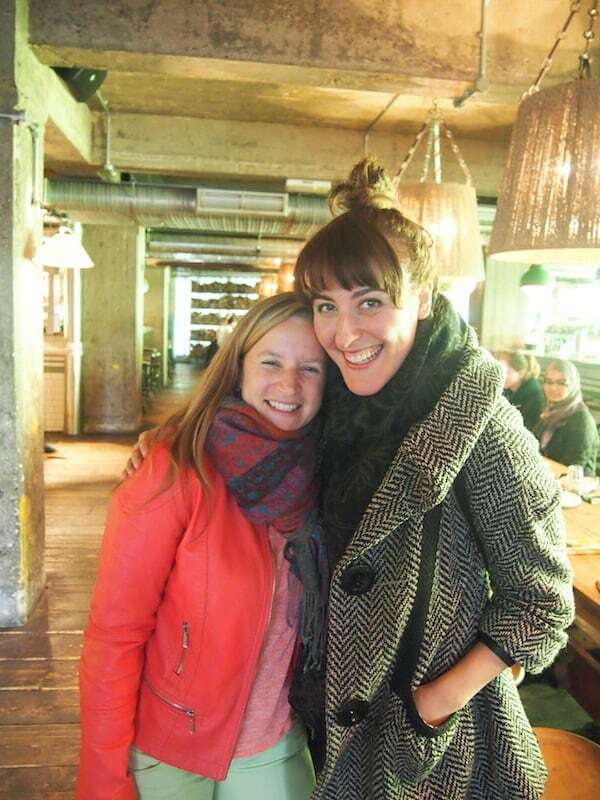 What a welcome: This is Nicole, our wonderful Eating London tour guide, with her happy smile and contagious sense of humour, at our first tasting stop of the Eating London Food Tour. The famous bacon sandwich really makes for a great start into the (tour) day …! “Ich steh’ auf St. John”, is what we say in German: St. John Bread & Wine is definitely the place to go to for a crisp, tasty bacon sandwich. Btw: All the bread here is home-made, too! 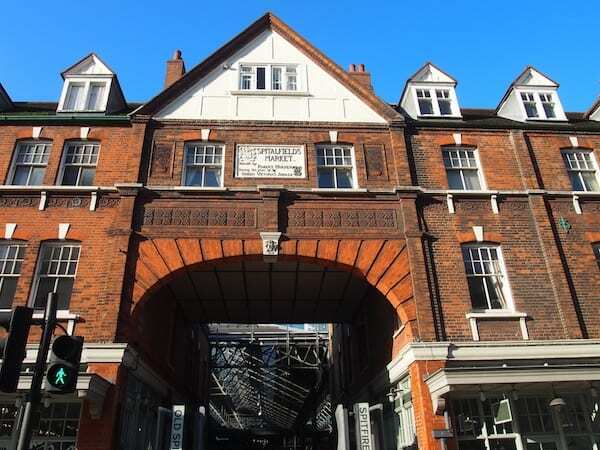 Another advantage: St. John’s is literally across the main gate of the Old Spitalfields Market, a historic market place in East London that is definitely worth checking out on any London visit. 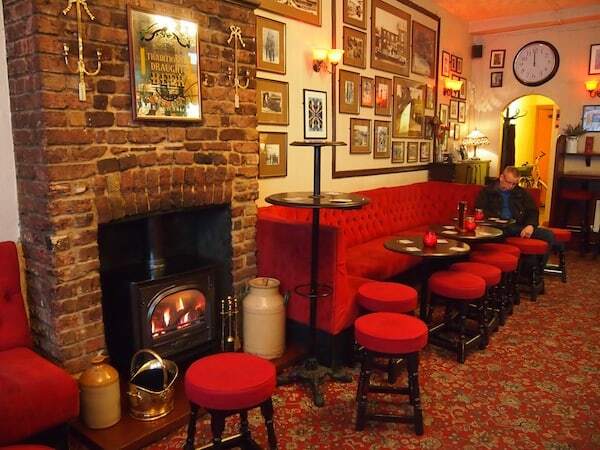 The East End London Food Tour #2: The English Restaurant. 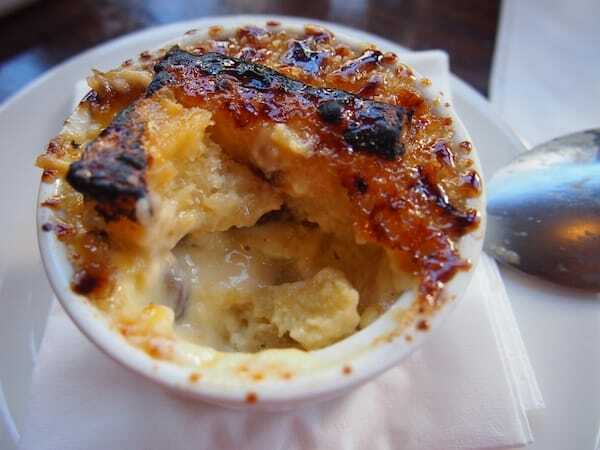 … complete with tasty #foodlover explorations, such as this melt-in-your-mouth Bread & Butter Pudding, a true English classic! 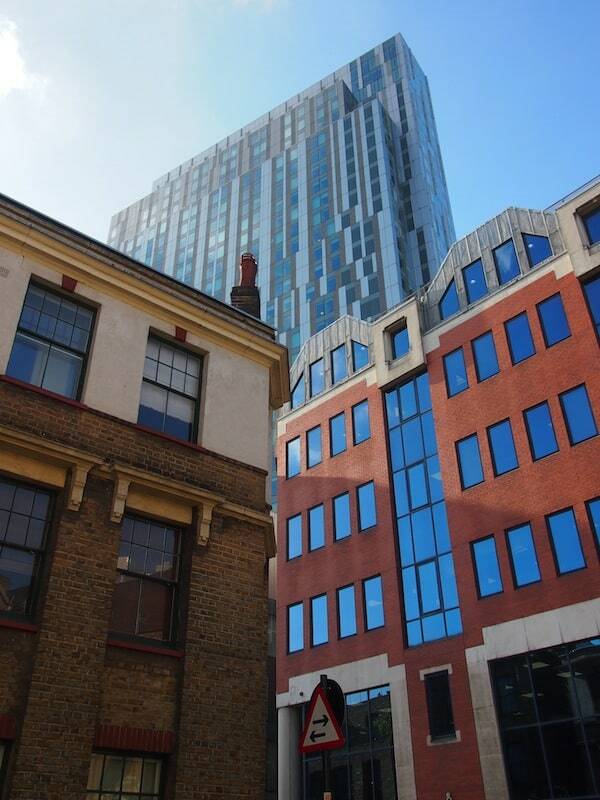 Heading round the corner, don’t forget to take a look up at the stark contrast of history & modernity in this East London district of Spitalfields, formerly the home of Jack the Ripper & many more legends, stories and tales of days gone by. The East End London Food Tour #3: The House of Androuet. 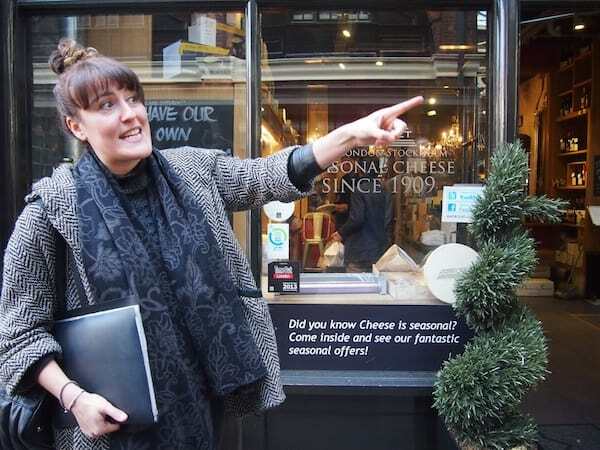 Little did I know about the delights of English cheese before I came to charming Leo & Alex, who are both cheese maturing experts and have turned their love for cheese into this cute little shop & tasting location at Old Spitalfields Market. 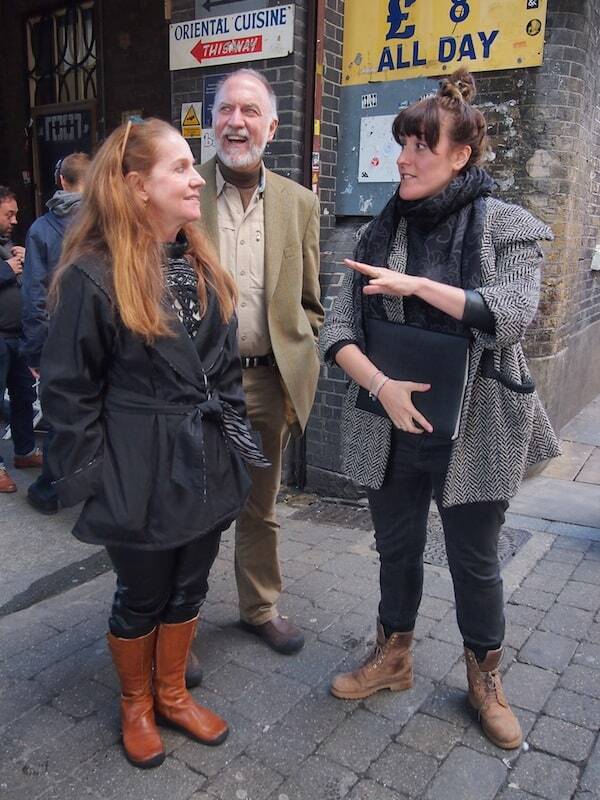 On the way there, we listen to Nicole filling us in on many historical facts & figures concerning London’s East End. 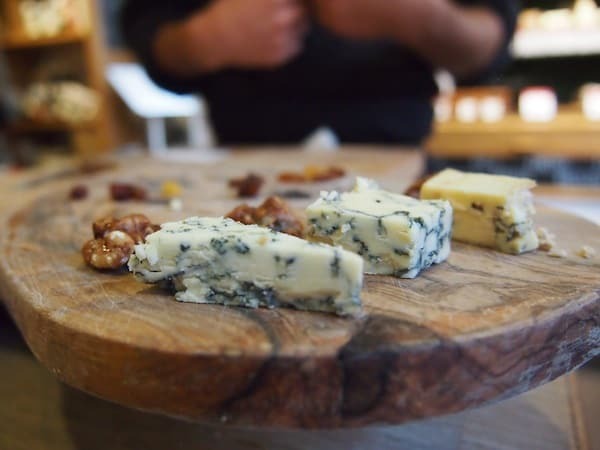 Still processing all the information and images conjured up in my mind, I am met with the smell of literally dozens of types of cheese – and once again drawn back into the present in the most pleasant way possible, that is with a fine “cheese lover” tasting coming our way! 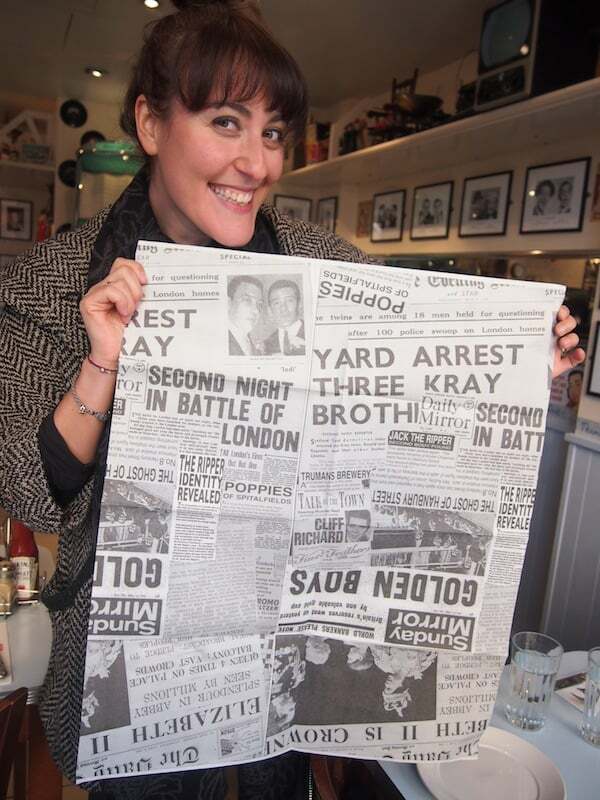 From past to present: Nicole is a storyteller of a kind and has lots of great maps and images to support her expert tales of London’s East End. Pointing us in the right direction for more food on our way, we enter “The House of Androuet” cheese lover’s paradise! Each one of the three cheeses we taste here has been made in England from what I take are happy cows given the excellent, creamy, melt-in-your-mouth cheese texture there. 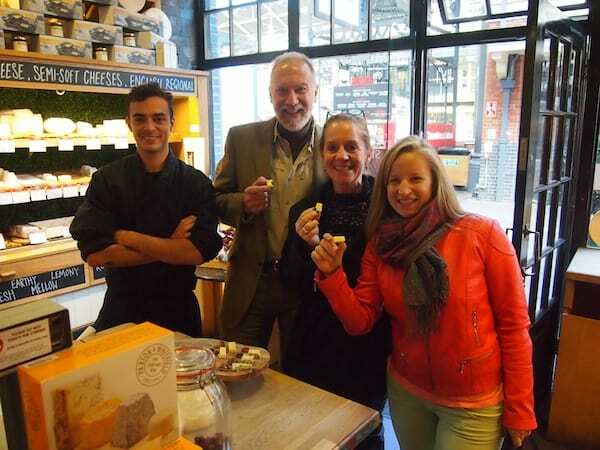 A cheesy moment for our happy group of food travellers! Little did I know that English blue cheese tasted oh so good ..! 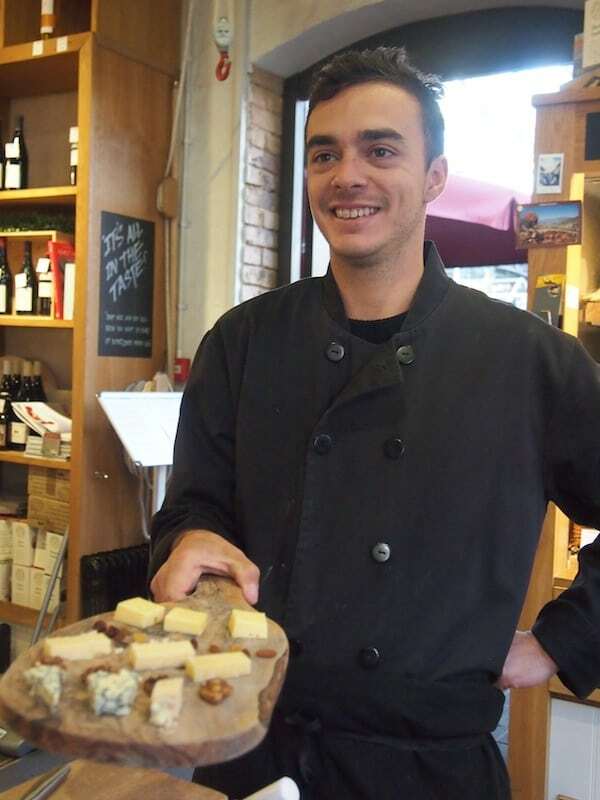 Do try this variety of Oglehshield, Westcombe cheddar & Stiltam cheeses on your next visit to this part of town. The East End London Food Tour #4: Poppies Fish & Chips. 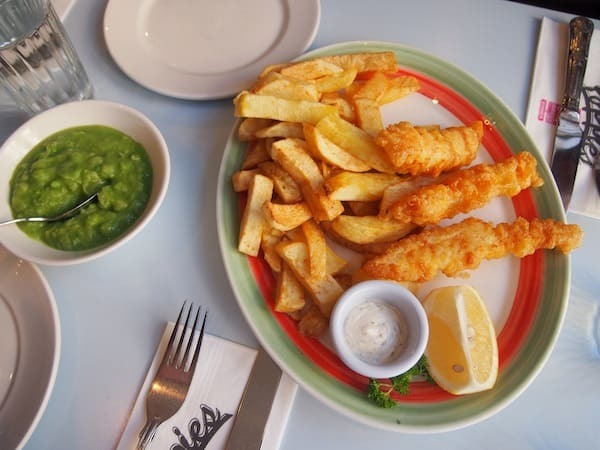 “I have once had some really good fish’n’chips on New Zealand’s Stewart Island, too, in the very south of the South Island.” – “Ah, that might be, but certainly not in London. 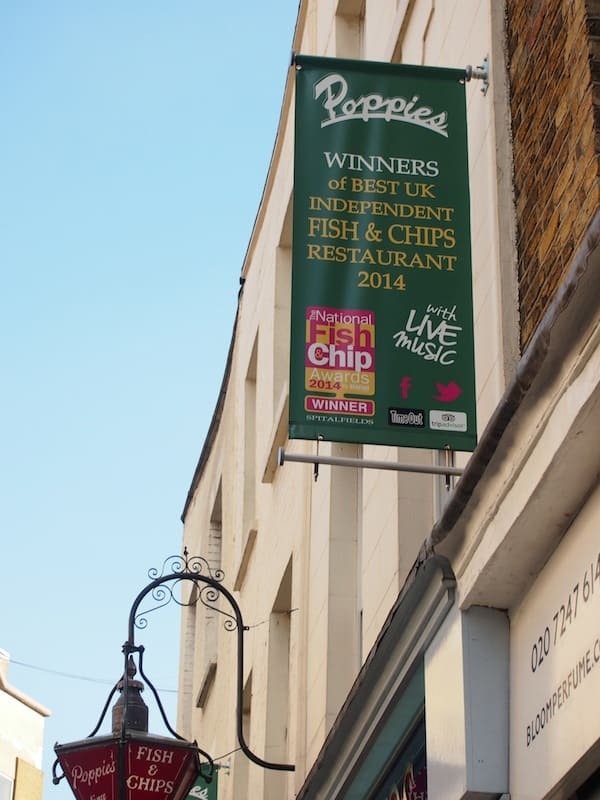 We are the best all over town!” A satisfied smile spreads across 72-year-old Pat Newland’s face, the owner of the Poppies Fish & Chips in East London. He gives me a wink, then gladly has his picture taken together with his colourfully dressed-up staff. Entering Poppies, therefore, is an experience in its own right – and one not to be missed, as eating excellent fish’n’chips is always a great idea given the quality of the fish here. 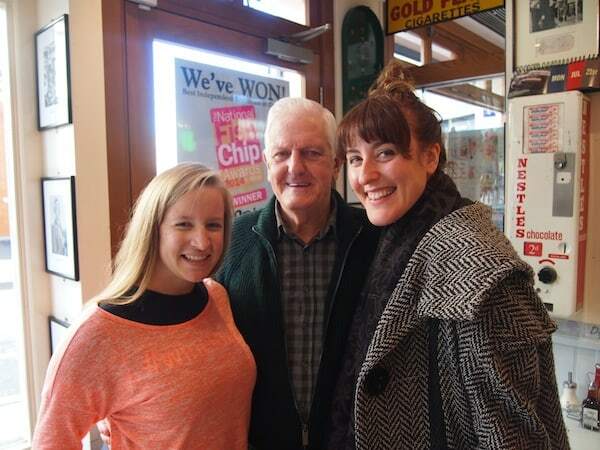 Finding our way thanks to the expert guidance of Nicole: Poppies have deservedly been named one of the best fish & chips restaurant in the UK in 2014! They even still wrap up your fish & chips in the very traditional way, printing their own “newspaper” that guarantees no ink is being spread on the food! Amazing. What you see is what you get: Traditional fish & chips served with a slice of lemon and home-made chips sauce, as well as creamy mushy peas. Yum !! We shall come back soon, dear Pat! Congratulations on your efforts for this place! The East End London Food Tour #5: Pride of Spitalfields. 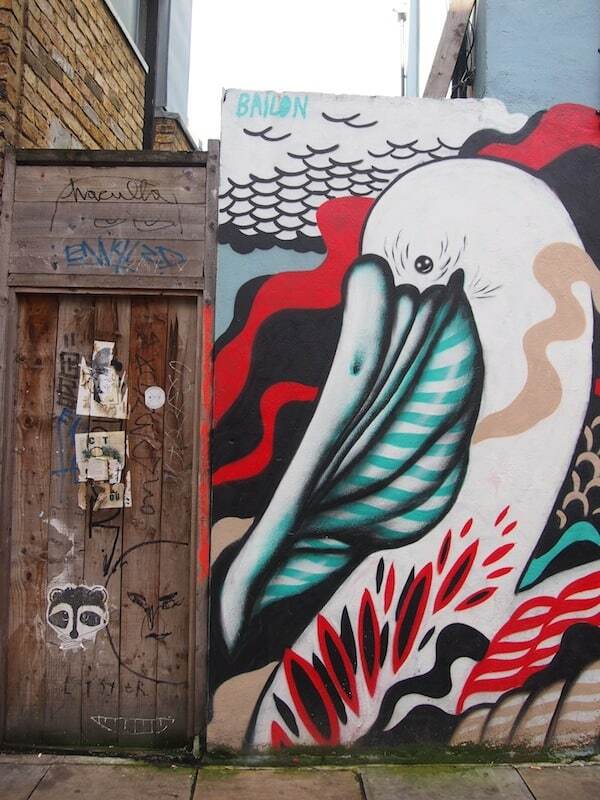 Walking round East London, you are met with many signs of amazing street art graffiti (besides unveiling the many #foodlover places on this tour)! The East End London Food Tour #6 & #7: Aladin & Beigel Bake on Brick Lane. “Aladin”, the name of our sixth tasting location during this Eating London Food Tour with Nicole, has me travel East immediately. 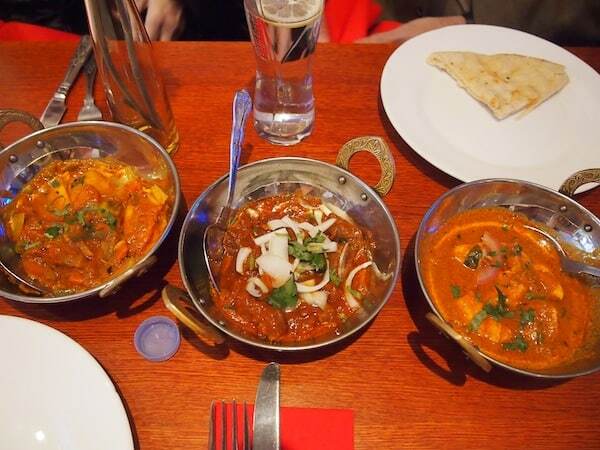 Having arrived on famous Brick Lane, now home to some of the city’s best Indian restaurants, we get a glimpse behind the scenes of what makes a typical Indian curry on London’s “Curry Mile”. Luckily, there are several of us tasting still … By now, my stomach is already full with the beautiful food tastings we’ve had! And there is more to come. 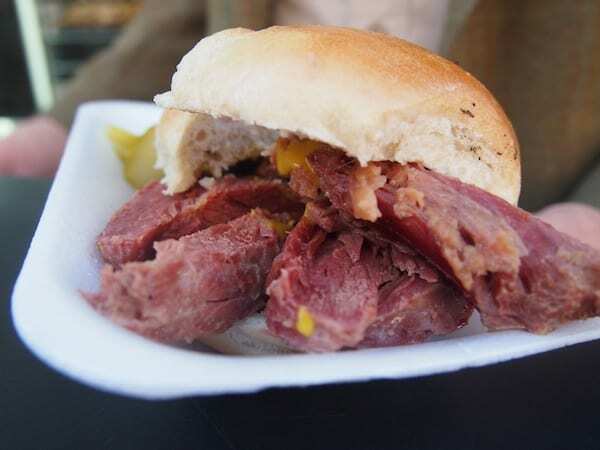 Salt beef with hot English mustard, gherkins & a secretly soft bagel is great street food I can truly recommend any time you are visiting Brick Lane. Check this out. Great curries on display at the “Aladin” restaurant served to us with traditional Naan bread, and voted among the best Indian restaurants in London! Nicole & her great sense of humour plus her knack for #foodlover storytelling are what keep us going! I do not even notice the time go by – only my satisfied stomach reminds me of that.! Try salty beef bagel at “Beigel Bake” for a dab at a culinary heaven of a kind …! Delightful to bite into, as very soft, tender and juicy. Oh so good. I am getting hungry again … You? The East End London Food Tour #8: Pizza East! 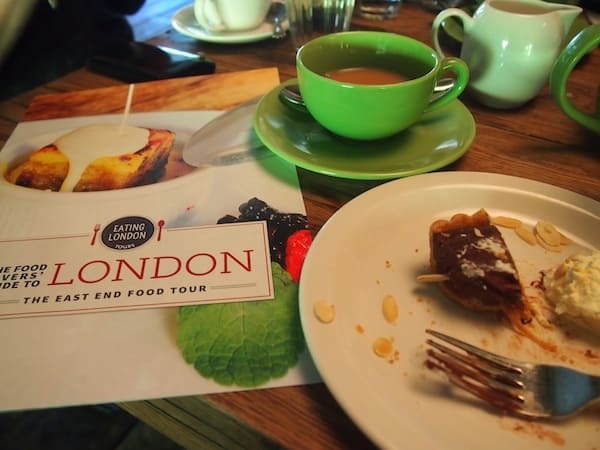 My salted caramel tart is gone quickly, despite feeling really, really full by now … in fact, this Eating London Food Tour provided me with what I needed for the entire day (and more!). What a GREAT way to see, feel, live, and EAT in the city of London! And especially thanks to Nicole, our lovely guide-turned-friend for the day: It would not have been the same without you dear Nicole! Keep going the way you do and share your passion with lots more travellers who like me enjoy a piece of tasteful history … Enjoy your meal everyone! Disclaimer: I have been invited Eating London on this culinary exploration of East London. All opinions are my own. Elena writes about creative destinations, shares her personal travel stories and brings inspiring photography & interesting news updates home to you. Her mission is: "Continue to be amazed at this world, one creative travel experience at a time." Ready for learning even more about creative travel? 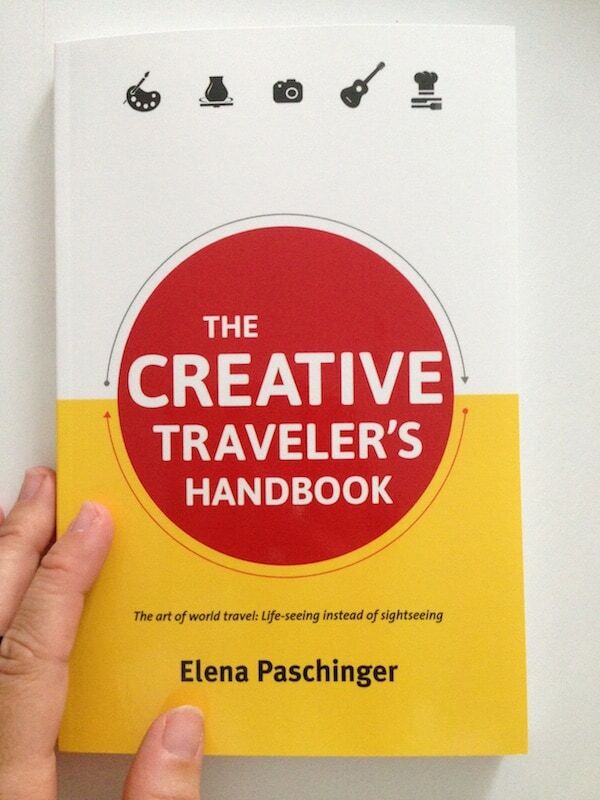 Elena has recently published "The Creative Traveler's Handbook". Chock full of inspiratinal stories, travel tips and advice, it offers everything you need for planning and managing your next creative escape, addressing beginners and experienced travelers alike. Here's how to get your hands on it now! #InspiredByIceland: A Most Magic Road Trip of Western Iceland. Elena on One hour south of Vienna: Pure mountain bliss in a local foodie’s paradise called “Molzbachhof”. Ingrid von Travelpotpourri on One hour south of Vienna: Pure mountain bliss in a local foodie’s paradise called “Molzbachhof”. astrid on One hour south of Vienna: Pure mountain bliss in a local foodie’s paradise called “Molzbachhof”. Diese Website verwendet Cookies, um Ihren Besuch effizienter zu machen und Ihnen mehr Benutzerfreundlichkeit zu bieten. Mit der Nutzung dieser Website stimmen Sie der Verwendung von Cookies zu. Weiterlesen.